IMPORTANT NOTE: This product has been recalled due to a non-marine spring in the mechanism. As such they are being remade and will be live again shortly. In the mean time, the Brass Weatherproof locks by ABUS also come in the same sizes and are 100% marine grade rust free. Please see that set of products as an alternative. Strangely Shield are one of the only padlock manufacturers to produce solid stainless steel padlocks. They are made from A2 304 stainless which is the classic 18/8 (18% chromium, 8% nickel) stainless steel. Although 316 is often regarded as superior in its weatherproof qualities, it is not as tough as 304. As such Shield deemed it best to manufacture their padlocks from 304 which is a good compromise. Generally speaking, this 304 stainless will out-last the application it is used on before any significant corrosion occurs, even in harsh marine environments. 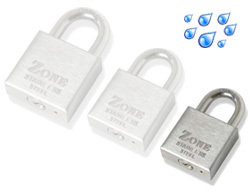 These padlocks are delivered with 3 keys each inclusive of the price. Need this padlock keyed alike? Please visit the Keyed Alike Section. 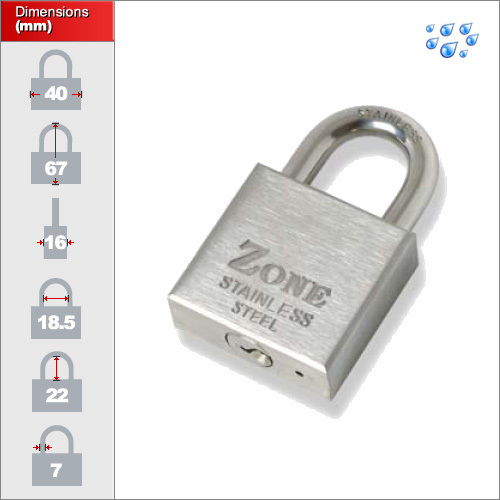 We hold 2 sizes of this padlock; 30mm and 40mm. Please use the drop-down menu above to select the size you require.